The $227-million Denton Energy Center, west of town, started commercial operations this summer. City officials said they need the natural gas plant to keep energy costs down and to supplement supplies of renewable energy. In February 2018 the Denton City Council voted to make Denton only the second city in Texas, after Georgetown, to set a goal of using 100 percent renewable energy. But there was a catch: A new natural gas-fueled power plant is part of the plan for the city of 136,000 residents north of Dallas-Fort Worth. Natural gas is promoted as cleaner-burning than other fossil fuels. It’s also environmentally contentious because of impacts ranging from local air quality to global warming. Debate rages, for instance, about whether its use helps or hinders efforts to reduce climate-warming greenhouse emissions. Students in the Spring 2018 senior news capstone class at the University of North Texas’ Mayborn School of Journalism set out to learn what the city’s plan might mean – for local air quality, for Texas energy and for Denton’s progressive image. The students worked under the direction of Mayborn lecturer – and Texas Climate News senior editor – Randy Lee Loftis. The students: Matt Berger, Jake Cramer, Andrea Czobor, Avery Dufilho, Julia Falcon, Brady Keane, Bethany LaChance, Brianna Lopez, Clay Massey, Colin Mitchell, Julian D. Perry, Alexandria Reeves, Derek Siler, and Desmond Smith. “Greening Denton” is a four-part series of text, video and audio reports that presents what they found. This second installment includes an article, two video mini-documentaries and a podcast. DENTON – When the City Council voted this year to make Denton just the second Texas city to run on 100 percent renewable energy, there was a caveat: The plan includes a brand new, natural gas-fired power plant. The $227-million Denton Energy Center, west of town near Denton Enterprise Airport, started commercial operations in July. City officials said they need the plant to keep energy costs down and to supplement supplies of renewable energy. But others asked how burning fossil fuels – with emissions that degrade air quality and contribute to climate change – can mesh with a stated goal of using 100 percent renewables from wind and solar. “To say ‘100 percent renewable’ is really kind of a shell game or trick to cover up the major issue, which is that we are building a gas plant,” said Adam Briggle, an associate professor of philosophy and religion at the University of North Texas. Briggle played a key role in guiding UNT to become a 100 percent renewable campus. He echoed the concerns many have about Denton’s path to the same goal. Denton’s city-owned Denton Municipal Electric now supplies 44 percent renewable energy to its customers. City officials expect to provide 89 percent renewables next year and 100 percent in 2020. The gas plant is meant to cover times of high demand and high wholesale energy costs. A main worry is the gas plant’s effect on what is already a high level of air pollution in Denton. The city had the worst air quality level in Texas from 2014-2016, according to the Texas Commission on Environmental Quality. 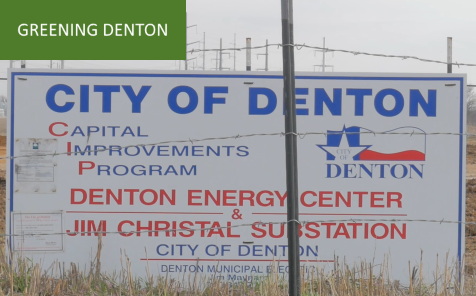 “A Closer Look” is the second of three mini-documentaries about Denton’s plan to switch to 100 percent renewable energy. The videos were produced by Julian D. Perry, Brady Keane and Colin Mitchell, and presented by Julian D. Perry. “The First 44%,” the first video report, examined progress and challenges. “A Closer Look” asks: How did Denton make the decision to rely on wind and solar power – and how does that jibe with the city’s decision to build a new power plant fueled by natural gas? Denton and Georgetown are in similar locations – downwind of large metro areas. Denton sits about 40 miles northwest of Dallas and 40 miles north of Fort Worth. Georgetown is about 27 miles north of Austin. Heavily traveled I-35 cuts through both cities. Georgetown, however, has had significantly cleaner air. Over the last 10 years, Denton has had 26 days with ozone over 85 parts per billion. Nine days reached above 90 ppb while one day in 2011 reached 102 ppb. Georgetown has had just one day over 85 ppb, in 2013. Bruns & McDonnell, the Missouri-based engineering firm that won the contract for the Denton Energy Center, has said the plant will have a minimal effect on air quality. “The plant will also be one of the cleanest natural gas-fired facilities in the industry as it will utilize selective catalytic reduction to minimize pollutants,” the firm wrote in an October 2016 press release. Construction started in early 2017 and was finished this year. In February, when the City Council voted on raising the renewables goal from 70 percent to 100 percent, Mayor Pro Tem Sara Bagheri cast the lone opposing vote based on the inclusion of the gas plant. Georgetown Mayor Dale Ross said the plant will help Denton. Progressive Denton has an unlikely role model for its move to 100 percent renewable energy: decidedly conservative Georgetown, a city in Central Texas north of Austin. In “100 percent completion,” the third of three video reports in the “Greening Denton” series, Georgetown Mayor Dale Ross, a Republican, explains that renewables aren’t a feel-good trend, but sound economics. Briggle said whether the gas plant is needed depends on what people want Denton’s renewable energy plan to achieve. The gas plant “is only necessary [based] on what your assumptions are and what you think it does,” he said. University of North Texas journalism students produced several podcasts, collectively titled “NT Nightly,” as part of this project. (NTDaily is the umbrella name for the university’s official student-produced news media.) In the first podcast, students began a discussion of Denton’s goal to use 100 percent renewable electricity. Here, they go further into the pros and cons of Denton’s energy plan. Participating this time: Matt Berger, Jake Cramer, Bethany LaChance, Julian D. Perry, and Derek Siler.